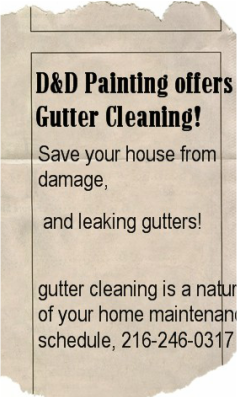 As a homeowner in Cleveland, gutter cleaning is a natural part of your home maintenance schedule. Leaves, dirt, and debris will pile up in your gutter whether you have nearby trees or not. Birds and pests can build nests and leave droppings. Though you may be aware that your gutters need to be cleaned every year, if you've been lucky enough to avoid a gutter failure, you may not realize just how dangerous leaving your gutters uncleaned for even a single year can be. 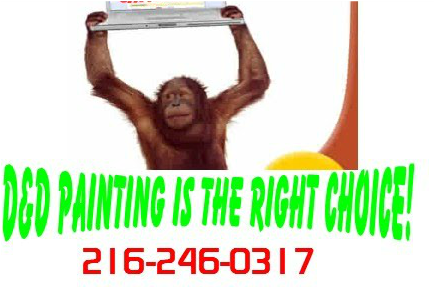 D&D Painting is your Cleveland Painting Contractor for all your Painting Services, we make a difference to your home, with interior painting, and all around exterior painting services, including pressure washing, fence, porch, and driveway cleaning and washing. When gutters or downspouts fail, any number of things can happen, all of them bad, some worse than others. Rain can trickle down your siding and if it manages to get behind the surface of your siding, the repair work can cost thousands of dollars. More commonly, this rainwater will make its way into the ground near your home, which can cause problems for your foundation or create stagnant pools of water on your lawn, a breeding ground for insects, fungus, and bacteria. Finally, the water may back up into your roofing system, generating a list of problems from roof, insulation, and/or drywall damage and increases the chances that mold and pests will find their way into your home. View our Painting Blog to view our painting updates, check out our Customers Testimonials, and view any questions you may have on our FAQ page. Contact us direct or email us using our Contact page.